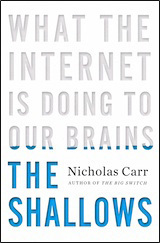 A couple recent articles around author Nicholas Carr’s writings and thoughts present a negative symptom of hyperlinks, mainly, reduced reader comprehension. Too many hyperlinks or links negatively affect our ability to process and understand. Mr. Carr’s call? Delinkification. Is hyperlinking a hyper waste? Search engine optimization (SEO) aside, for the moment, the whole goal of communication is to be understood. I find Carr’s thoughts on what hyperlinks are doing relevant to social media communication and marketing. Well the recent Wired article is subtly title: The Web Shatters Focus, Rewires Brains that title will grab your attention – for a second or 2. The premise: too many links reduce reader attention, lower reader comprehension. Back in the 1980s…there was much enthusiasm about the apparent advantages of digital documents over paper ones. Many educators were convinced that introducing hyperlinks into text displayed on monitors would be a boon to learning. Hypertext would strengthen critical thinking, the argument went, by enabling students to switch easily between different viewpoints. Freed from the lockstep reading demanded by printed pages, readers would make all sorts of new intellectual connections between diverse works. The hyperlink would be a technology of liberation. However, the web’s hyperlink [strangely, the word hyper seems an all-too-accurate explanation of our attention span] system does seem to increase certain functions, but this is at the decrease of other, important functions. The Internet is an interruption system. It seizes our attention only to scramble it. There’s the problem of hypertext and the many different kinds of media coming at us simultaneously. There’s also the fact that numerous studies—including one that tracked eye movement, one that surveyed people, and even one that examined the habits displayed by users of two academic databases—show that we start to read faster and less thoroughly as soon as we go online. Plus, the Internet has a hundred ways of distracting us from our onscreen reading. Most email applications check automatically for new messages every five or 10 minutes, and people routinely click the Check for New Mail button even more frequently. Office workers often glance at their inbox 30 to 40 times an hour. Since each glance breaks our concentration and burdens our working memory, the cognitive penalty can be severe. While I might make an argument that SEO hyperlink strategies might get you exposed to a larger audience of potential readers, if those readers don’t get what you are presenting or writing, what is that value? What is the value of half understood blogs? Half read public relations articles? Half read news releases? The ultimate trump to hyperlinks is compelling content, always. But you can not provide compelling content [and I am guilty of this] when you have a bunch of hyperlinks buzzing around people’s head distracting more than contributing. A solution to this might be to use more end notes or references at the end of the post? That might let a reader read without interruption: the old research paper method. I don’t want to overstate the cognitive penalty produced by the hyperlink (or understate the link’s allure and usefulness), but the penalty seems to be real, and we should be aware of it. But is this progress from the paper-based world? I’m not sure we need to push the envelope on everything. Again, what is your goal? My goal is to be understood, not just to blast out blog posts no one reads or understands in the name of good SEO. We’ve seen spammers since the 90s try creating flashy, and flashing, web-based neon signs to get our attention, let’s take a pause from multi-tasking, from communication saturation for single-tasking and for comprehension. Let’s not call this a new issue, I found a blog post using hyperlinks as an engine optimization tool from 2004 bringing up many of the same points? Perhaps I missed it before, any guesses why?